The UK Government has announced £5.4 million in funding to enable the launch of a centre of excellence in Cambridge to champion the digital revolution in the built environment. The Centre for Digital Built Britain is part of a landmark Government-led investment in growing the UK’s construction sector which was announced on Wednesday 29 November. It is a partnership between the Department of Business, Energy & Industrial Strategy and the University of Cambridge to support the transformation of the construction sector using digital technologies to better plan, build, maintain and use infrastructure. The Centre will focus on the ongoing transformation of the built environment through the digital tools, standards and processes that are collectively known as Building Information Modelling (BIM). It will continue the work of the Digital Built Britain Programme and the UK BIM Task Group to support delivery of the Government’s Digital Built Britain Strategy. The strategy seeks to digitise the entire life-cycle of our built assets; finding innovative ways of delivering more capacity out of our existing social infrastructure, dramatically improving the way these assets deliver social services to provide improved capacity and better public services. Above all, it will enable citizens to make better use of their cities and infrastructure. Led by Professor Andy Neely, Pro-Vice-Chancellor: Enterprise and Business Relations, the Centre builds on the expertise and experience of faculty from the Cambridge Centre for Smart Infrastructure and Construction (CSIC), Cambridge Big Data, the Distributed Information and Automation Lab (DIAL), the Cambridge Service Alliance (CSA) and the Institute for Manufacturing (IfM) to form a Research Bridgehead. The Bridgehead work with a team of specialists from Digital Built Britain Programme, and partners from industry and academia, to develop and demonstrate policy and practical insights that will enable the exploitation of new and emerging technologies, data and analytics. The aim is to enhance the natural and built environment, thereby driving up commercial competitiveness and productivity, as well as citizen quality of life and wellbeing. 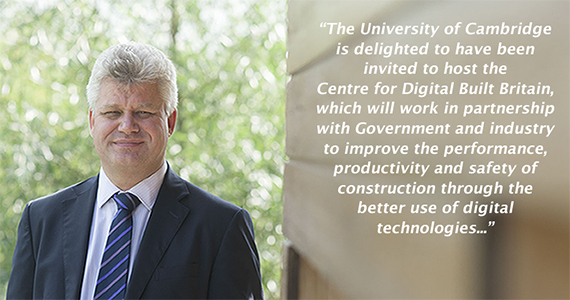 Professor Neely: “The University of Cambridge is delighted to have been invited to host the Centre for Digital Built Britain, which will work in partnership with Government and industry to improve the performance, productivity and safety of construction through the better use of digital technologies." Dr Jennifer Schooling, Director of CSIC, said: “The construction and infrastructure sector are poised for a digital revolution, and Britain is well placed to lead it. Over the next decade advances in BIM will combine with the Internet of Things (IoT), data analytics, data-driven manufacturing and the digital economy to enable us to plan new buildings and infrastructure more effectively; build them at lower cost; operate and maintain them more efficiently; and deliver better outcomes to the people who use it. “This is a wonderful opportunity to put the breadth of research and industry engagement expertise from Cambridge at the heart of Digital Built Britain,” she added. The UK is leading the world with its support of BIM implementation in the construction sector through its commitment to the Digital Built Britain Programme. By embedding Level 2 BIM in Government infrastructure projects such as Crossrail, the programme has contributed significantly to the Government’s £3 billion of efficiency savings between 2011 and 2015. Since 2016, all UK Government procured projects require Level 2 BIM, which has achieved considerable savings for its construction procurement to date. Tasked with supporting innovation in the construction sector, the Construction Leadership Council has also put BIM at the heart of its sector strategy Construction 2025; which commits to cut built asset costs by 33%, and time and carbon by 50%. The Centre for Digital Built Britain will continue to build on this transformative approach and will be based in the Maxwell Centre in West Cambridge. It will be formally launched in spring 2018. This article was first published by the Department of Engineering and has been edited from the Centre for Digital Built Britain website.